“… my only sunshine. You make me happy when skies are grey.” The best possible thing for me to do when I’m feeling down is to dress like I’m sunshine. I went a straight week feeling sorry for myself. I wore the same t-shirt and leggings for a good five days. I was feeling insecure, down, and unworthy. WHY.WHY.WHY do I do that to myself? I know I can’t be the only one. Sometimes being a slob, watching F.R.I.E.N.D.S. re-runs, and eating endless amounts of chocolate is all a girl really needs. After I was done being annoying, I decided to brush myself off, tell myself that I’m enough, put on these pants, and WA-LA… I was born again. I need my sad days. 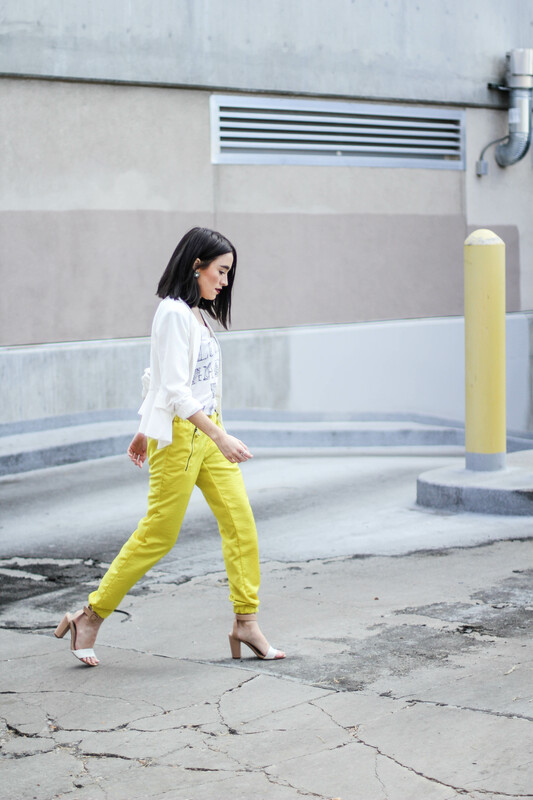 But the best way to get over those sad days is put on some bright yellow pants. Seriously, who needs medication when these bad boys did the trick. At my job, I see way too many insecure women. It breaks my heart. I just want to scream at them as say “ARE YOU SERIOUS! YOU ARE BREATHTAKING!” I know we all have those insecurities. I have plenty. But we can’t let those small, insignificant details define us. Never let them break you. I’m just 20. I still have a lot of growing up to do and a lot of things about myself that I just need to accept. Before you begin to feel sorry for yourself, run to your closet, snuggle with your favorite item of clothing (your sunshine) and be thankful. Life is a WAY too short to not feel beautiful every singe day. The yellow trousers suit you really well!! Those pants are fabulous. Love the whole look!